Your vehicle needs to maintain an effective differential component. When you have a vehicle that requires hard-driving or has suffered a minor collision, the differential can be affected. The component is meant to compensate the ratio at which the wheels spin as you turn on corners. There will be a difference because the outer tires are turning at a different rate than the inner tires. Every time your vehicle rounds a corner, the differential is expected to be effective. Eventually, your vehicle’s differential will require a rebuild. Transmission Technicians has a team of specialists that are trained and ready to perform your differential rebuild services. 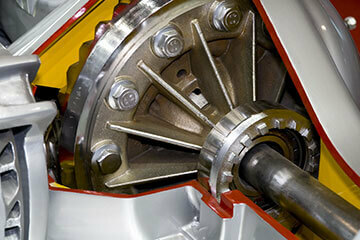 The differential can be maintained as long as you need as long as you trust the experts at Transmission Technicians. Our team can make sure your car’s wheels, tire, axle, and transmission are all operating effectively. The differential will usually tell you when it needs service. You can trust us to take care of you differential rebuild or repair needs. With decades of specialization, we stand heads and shoulders above any of our competitors in this area. Since we specialize in transmission-related services, you can rest assured that whatever you bring us will be handled by the best the auto repair industry has to offer. We’ll get your differential rebuild services right the first time. Save yourself time and money by bringing your differential rebuilds to our experts first! Schedule Your Differential Rebuild Service! The team at Transmission Technicians is able to handle every component associated with your vehicle’s transmission. Our experts are skilled at performing any differential repairs or differential rebuilds. Contact us today by visiting our shop so we can get a look and quickly diagnose your vehicle. Or give us a call today at 516-882-3707 to set up an appointment.